From 16 – 19 November, 130,000 specialist visitors from around 120 nations came to Düsseldorf (previous year: 128,500). The portion of international visitors amounted to just over 50 percent, a strikingly large number came from the foreign markets of the USA, Latin America and especially from Iran and countries located in the Arabic-speaking regions. This year’s exhibitors estimate that over the next year they could generate more than $6 million in export sales as a result of their participation at MEDICA 2015. Through OIBD, Pennsylvania has participated in MEDICA every year since 1990. The Pennsylvania pavilion provides an opportunity for small and medium-sized companies to exhibit at this prominent trade show without the high cost. Over the years, MEDICA has proven to be an excellent platform for promoting Pennsylvania companies and is now one of OIBD’s most successful trade shows. The Pennsylvania Global Access Program (GAP) is a grant designed to enhance the capability of small to mid-sized companies to increase export sales. GAP offers up to $3,500 per year in grant assistance to qualifying Pennsylvania companies to reimburse 100% of eligible expenses associated with specific export promotion activities. Program funding has been secured through September 29, 2016, and a company's upcoming international business trip or other export promotion activity may qualify. This program is funded in part through the U.S. Small Business Administration (SBA) State Trade and Export Promotion (STEP). Pennsylvania Industrial Development Authority (PIDA) program will support the continued growth of Pennsylvania small businesses that are projected to create and retain jobs and support private sector growth. PIDA approved $1.4 million in low-interest loans for four projects in Bedford, Berks, and Monroe counties, generating more than $5.8 million in total investments. Selected applicants can secure low-interest financing through Dec. 31, 2015. PIDA assistance is provided through Certified Economic Development Organizations only. Contact your county representative or contact the PIDA Office at (717) 787-6245 for assistance. PHILADELPHIA, Pa /CBRE Press Release/ - Over the next decade, 20 markets worldwide—including Philadelphia, Seattle and Miami—are set to emerge as global logistics hubs, according to a new report from CBRE Group, Inc. These emerging locations share a number of characteristics, including significant investments in infrastructure, new trade policies and agreements, and more advanced supply chains and technologies. The Eastern Pennsylvania region, anchored by Philadelphia and fueled by the growth of the Lehigh Valley, is an example of a hub that has been transformed by the rapid growth of advanced technologies. This mid-Atlantic location enjoys access to more than 100 million people within a one-day drive, including key metropolitan areas such as New York, Washington, D.C., and Boston. Eastern Pennsylvania has easy access to the major East Coast ports in New Jersey, Pennsylvania and Maryland, which, combined, handle the second-most Twenty-foot Equivalent Unit (TEU) volume in the U.S., and an abundance of well-located land suitable for the extra-large distribution centers favored in the retail supply chain. The market is the fastest-growing in the U.S. and quickly becoming the main bulk distribution location in the Eastern U.S.
Over the past 35 years, global trade has increased by nearly 600%, propelling the growth of logistics hubs in virtually every country around the world. 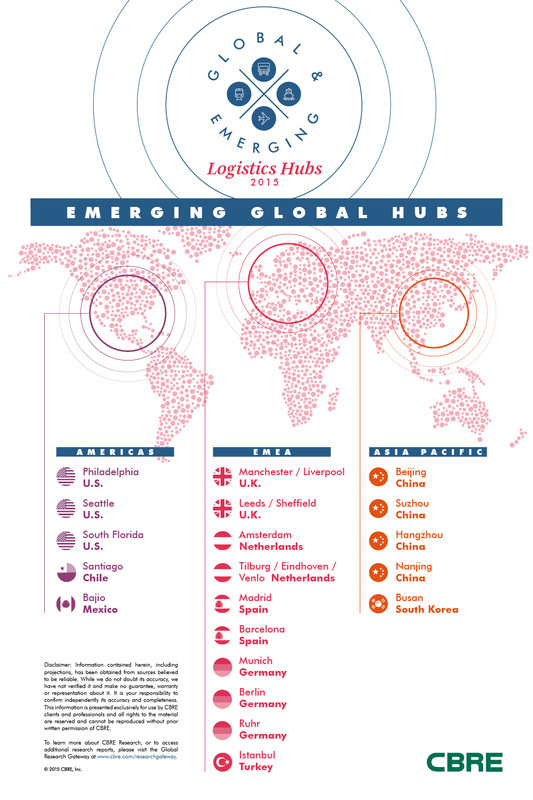 These hubs are connected via hub-and-spoke systems centered around 30 global logistics hubs—including the likes of Los Angeles, Chicago, Hong Kong, Tokyo, London and Paris—that form the backbone of today’s global supply chain. Q: Is Export Credit Insurance cost-prohibitive for small businesses? A: Depending on an exporter’s needs and risk exposure, costs may vary from $0.55 to $1.77 per every $100 of invoice value . Our most popular product Express Insurance, for example, allows the exporter to pay $0.65 per every $100 of invoice value for credit terms up to 60 days. For a shipment of $10,000 to a foreign buyer, the premium due is just $65 ($10,000 x .0065). The best way to find out the exact costs for your business is to contact an EXIM export finance specialist directly. Q: I am a busy person; how long will it take to get approved for insurance? How difficult is the application? A: The application is online, simple and user friendly. However, most exporters work with a trade finance broker and the broker’s fee is no additional cost, as it is included in the premium paid. Brokers guide exporters through the application process and provide ongoing service, such as assistance in filing claims. The turnaround time for Express Insurance is typically under 10 business days . To find out more about the application process, schedule a consultation with a highly experienced export financial specialist today. Q: What deal size would make it worthwhile? Is my business too small? The new air transport agreement replaces an existing agreement between the two countries dating back to 1960 and is the result of more than two years of negotiations led by the US Department of State with the Department of Transportation and the Department of Commerce. According to figures reported by Reuters Mexico, the US and Mexico share 19 million passengers a year, with the US possessing a fleet of 7,500 aircraft, against 300 for Mexico. The deal awaits approval by the Mexican Senate, but Mexico Transportation Secretary Gerardo Ruiz Esparza predictes that will come early in the new year. No such ratification is required in the U.S.
We welcome the signing this morning of a new air transport agreement between the United States and Mexico. This landmark agreement with one of our largest aviation partners will significantly increase future trade and travel between the United States and Mexico. The signing of this important agreement is the result of more than two years of negotiations led by the Department of State with the Department of Transportation and the Department of Commerce. The new agreement will benefit U.S. and Mexican airlines, travelers, businesses, airports and localities by allowing increased market access for passenger and cargo airlines to fly between any city in Mexico and any city in the United States. Cargo carriers will now have expanded opportunities to provide service to new destinations that were not available under the current, more restrictive agreement. This new air transport agreement further elevates and strengthens the dynamic commercial and economic relationship between the United States and Mexico and advances our goal of shared prosperity. By allowing air carriers to better meet increasing demand in both countries, the agreement will help drive economic growth in sectors beyond aviation, including tourism and manufacturing. Following internal ratification procedures in Mexico, both governments will be in a position to bring the new agreement into force. A new agreement on trade in services, under the framework of the Mainland and Hong Kong Closer Economic Partnership Arrangement (CEPA), will allow business and professionals in Hong Kong to enjoy greater access to mainland China’s growing services market, effective June 2016. Real gross domestic product -- the value of the goods and services produced by the nation’s economy less the value of the goods and services used up in production, adjusted for price changes -- increased at an annual rate of 2.0 percent in the third quarter of 2015, according to the "third" estimate released by the Bureau of Economic Analysis. In the second quarter, real GDP increased 3.9 percent. The GDP estimate released today is based on more complete source data than were available for the "second" estimate issued last month. In the second estimate, the increase in real GDP was 2.1 percent. With the third estimate for the third quarter, the general picture of economic growth remains the same; private inventory investment decreased more than previously estimated. The increase in real GDP in the third quarter primarily reflected positive contributions from personal consumption expenditures (PCE), nonresidential fixed investment, state and local government spending, residential fixed investment, and exports that were partly offset by a negative contribution from private inventory investment. Imports, which are a subtraction in the calculation of GDP, increased. The deceleration in real GDP in the third quarter primarily reflected a downturn in private inventory investment and decelerations in exports, in PCE, in nonresidential fixed investment, and in state and local government spending that were partly offset by a deceleration in imports. Real gross domestic income (GDI), which measures the value of the production of goods and services in the United States as the costs incurred and the incomes earned in production, increased 2.7 percent in the third quarter, compared with an increase of 2.2 percent in the second. The average of real GDP and real GDI, a supplemental measure of U.S. economic activity that equally weights GDP and GDI, increased 2.3 percent in the third quarter, compared with an increase of 3.0 percent in the second. NOTE. Quarterly estimates are expressed at seasonally adjusted annual rates, unless otherwise specified. Percent changes are calculated from unrounded data and are annualized. "Real" estimates are in chained (2009) dollars. Price indexes are chain-type measures. ​This news release is available on BEA's Web site / view PDF. The following is an excerpt of SeaLand's latest press release highlighting the details of their new Atlantico route. To read the full press release, visit SeaLand's website here. "SeaLand, the Intra-Americas regional ocean carrier of the Maersk Group, announces a new service dedicated to trade between the Gulf of Mexico and Eastern and Central United States. The new SeaLand Atlantico service will provide weekly coverage between the ports of Veracruz and Altamira, Mexico and Philadelphia. The service features a fast 6 day transit time. From Philadelphia, Mexican shippers are able to access up to 40% of the U.S. population within only a day's drive. It is also the epicenter of some of the most robust rail networks in America. The new service will have its first sailing out of Veracruz on January 26th, 2016. This option is especially geared for producers and exporters of perishable goods to the U.S. and provides the economies of scale, security and reliability of an ocean service combined with an expedited transit, ideal for moving goods such as avocados, lemons, tomatoes and commercial cargo." "Trade between Mexico and Pennsylvania amounted to close to 7 billion dollars per year [in 2013.] With Philadelphia as its epicenter, this service effectively connects companies to the U.S. Central and Eastern regions offering supply chain efficiencies for importers and exporters alike. It is a desire that we have been cultivating for years and that will become a reality very soon"
The World Trade Center of Greater Philadelphia congratulates our member Scopelitis Garvin Light Hanson & Feary on their recent accomplishment earning the title as one of the nation's top 30 law firms for client service! Read the full press release below. "'Interest in Cuba has reached levels not seen for a generation,' said Scott Laurence, senior vice president of airline planning for JetBlue." Russia is currently holding eight Turkish vessels in its ports after Turkey shot down a Russian warplane, the Daily Sabah in Istanbul reported Wednesday. Moscow has since detained Turkish travelers, stopped Turkish vehicles from crossing into Russia and now denied Turkish trade ships from entering Russian ports. In response, Turkey has tightened its inspections of Russian vessels coming into Turkish ports. Turkish maritime authorities had detained 27 Russian ships as of Tuesday due to missing documents or transactions in line with the Mediterranean and Black Sea memorandums.